Dear Sergeant Fuller, You won’t know me for another two years, but I am your daughter. So begins a letter sent decades into the past, from a daughter searching for answers to a soldier serving in war-torn Vietnam, in this true story of service and sacri-fice, love and redemption, and the power of forgiveness. A box with Love Letters from Vietnam etched on the lid waits buried in a closet, holding scrawled thoughts written on Air Force stationery from a passionate yet deeply flawed soldier stationed outside Da Nang to his young wife in east Texas. Years pass before a fate-ful, deadly winter night leads the soldier’s daughter, Jennifer, to open the box, read the letters, and answer her father back in time. She tucks her letters into a package with no address, because she no longer knows where to send them. Until she is sitting in a theater in Austin, Texas, at a performance by singersongwriter Alex Woodard and hears him talk about writing songs inspired by letters. 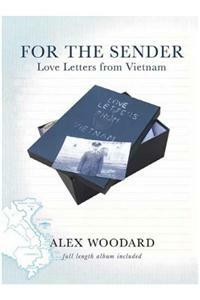 Her remarkable correspondence with her father takes Woodard on his first steps into the dichotomy between dark and light, as he imagines himself as Ser-geant Fuller in Vietnam and begins to write songs sung from Fuller’s heart. Woodard’s quest to learn more about the man and the war he fights both in Vietnam and back at home evolves into an extraordinary journey, propelled by a companion album of songs that features Woodard as Sergeant Fuller and his friend Molly Jenson as Jennifer. Their voices carry the songs inspired by these beautiful, raw, revealing love letters not only sent from Vietnam, but as the story unfolds, beyond..